-Whether you are losing sound clarity due to acoustic resonances? -How tone controls should be set for flat response? -Whether your system distorts sound at high volume levels? -If your stereo image is precisely centered? This indispensable tool helps answer these, and many more questions about your audio system's performance. Bring it with you to the store to evaluate new gear! How it works: This CD contains precise, computer-calculated audio signals. Each sample is as mathematically perfect as the CD audio format allows. Left and right signals are identical in amplitude and phase, allowing you to check channel balance and phasing. Precise sinusoids check frequency response over a range of 5 to 20,480 Hz. White noise exercises the full spectrum uniformly. Precise square waves enable measurement of transient and phase response. Pure and mixed sinusoids at maximum amplitude enable distortion and inter-modulation measurements. Signals are announced for easy identification. Most are on dedicated tracks, so they may be easily looped. They are also described by CD TEXT, and will appear on players that support this capability. Supplied with a copy of this How-To Article. 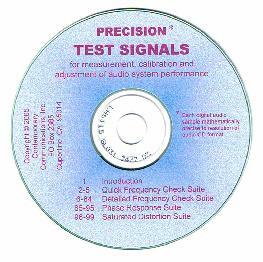 The Precision Test Signals on this CD are suitable for accurate evaluation, calibration, and adjustment of frequency response, phase response, and distortion characteristics of audio systems.� Each digital audio sample is computer calculated to the maximum accuracy supported by the CD-audio format.� Left and right channel signals are identical in frequency and phase.� Unless otherwise noted, all signals are recorded 6 dB below maximum level.